WorldClassRoom FAQs - How Do I Roll Over My Concourse Syllabus? After you have entered a syllabus for a course, you can roll over the content from one term to the next in Concourse. By rolling over, you will save yourself time keying in items that don't change from one course to the next, such as the Course Description and Outcomes. 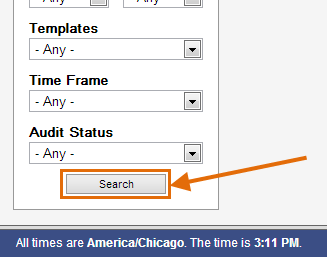 For things that may change, like Meeting Times or Schedule, you can import from a prior term and then edit the information. 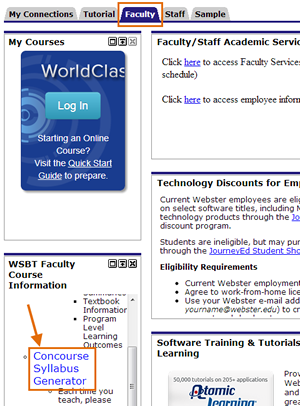 Log in to Connections, click on the Faculty tab, and click on Concourse Syllabus Generator in the WBST Faculty Course Information channel. Concourse will open in a pop-up window. Under My Courses, click on the title of the course for the syllabus you are preparing. Once in syllabus, click on the Syllabus menu and choose Import from the drop-down. Click Advanced to expand your search options. Enter your last name in the Instructor field, and the Session (e.g., SU) and Year (e.g., 2013) of the past syllabus that you want to import. Then scroll down and click the Search button. 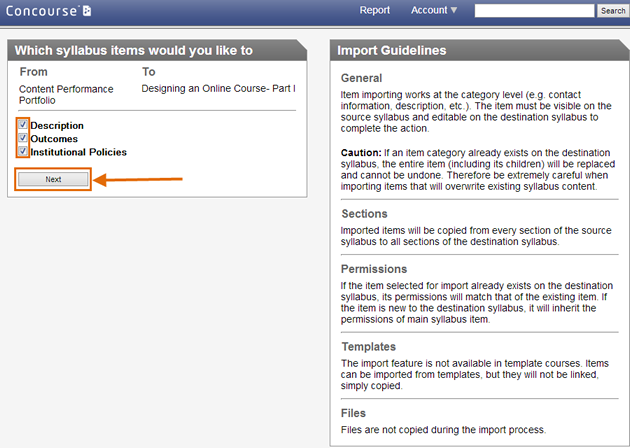 Click the Import button to the left of the course from which you want to import syllabus content. Check the boxes next to the items that you want to import and then click the Next button. Note: As Concourse states: "Caution: If an item category already exists on the destination syllabus, the entire item (including its children) will be replaced and cannot be undone. Therefore be extremely careful when importing items that will overwrite existing syllabus content." The screen will reload with your syllabus, including the imported content. Go to the Syllabus menu and choose Edit to make changes for the new term.